Regulate access, prevent unauthorized entry, and protect yourself against valuable goods or sensitive information from going missing with the Linear IEI 2000e access control keypad. The IEI 2000e lets you use a superior technology to conquer the multitude of problems caused by keys. Instead of agonizing over how many keys circulate about, and whether your perimeter and inside openings stay secured, you can install this keypad to keep doors locked and eliminate the distributing, collecting, and accounting of keys. The 2000e deploys well as a nice and easy solution for conveniently handling up to 500 users in stand-alone mode. The IEI 2000e also works as a front end keypad for Linear IEI Max 3, and MiniMax 3 controllers, or an existing Wiegand controller. 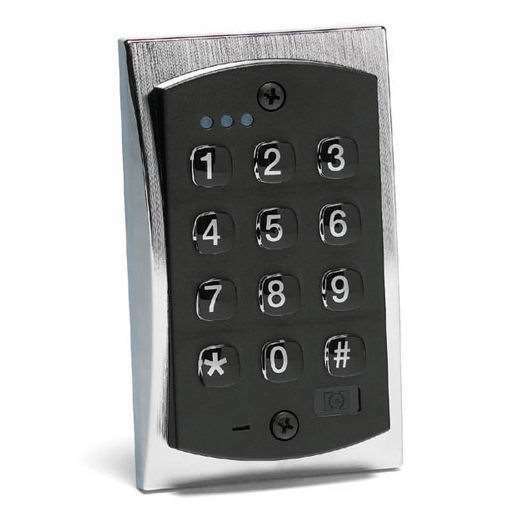 Not only will this keypad accommodate you as you grow, you can tie it into an external monitoring burglar alarm panel because of it's alarm shunt output, and sound a forced entry or door ajar event. We have this key pad at several locations and love it. Easy to program and use. I made my first purchase of a stand alone key pad. It workd great, easy to assemble, bu the startup could have been a little clearer. Great product would definitely recommend it. The second purchase was for the “front end” which was a total system with software. One again the documentation is not as clear as I would like to see. I think it assumes I already know the product. I just got it, and am reviewing the documentation. I like what I have seen so far, and the product choices are great. We really enjoy the key pad on our property. It has made my life so simple, I can not tell you in words, how simple it is has made it. We used a key card originally, and we are a hot springs resort in the mountains. So water and cold does not mix. Thank you also for getting the key pad to me as quickly as it was done. Yes, it can be wired to stay lit at all times there is no need to press any additional numbers to light the keypad. Answered by the admin This reader will operate in the form desired through locking out and unlocking the fuel pump. This is a 12v keypad so your voltage would need to be stepped down in order for it to work. As for the diagrams, you can call our support team at 937-247-9327 option 3 and they will be able to get you the information you are looking for. Yes, if the Netaxs Panel will accept Weigand keypads it can be used as a front end keypad in Weigand mode. It would depend on if you are looking to disable the system or just users after hours. Yes, you are able to disable users after hours, but the only way to disable the system would be to disconnect it from power. The most common used on most projects is 16/6 AWG shielded and stranded, but that can vary up or down with the distance of the run and what voltage is being used.